Images of Château de Chillon Castle on the shores of Lake Geneva near Montreux in Switzerland. Chillon Castle is photogenic and claims to be the most-visited historic monument in Switzerland. It is probably one of the most-photographed Swiss buildings too. Chateau de Chillon is a lovely castle on a small islet in Lake Geneva in the Switzerland. The romantic castle is a family-friendly destination and very popular with travelers of all ages. Although a historic monument, the main attraction is the building itself rather than exhibitions or artworks. 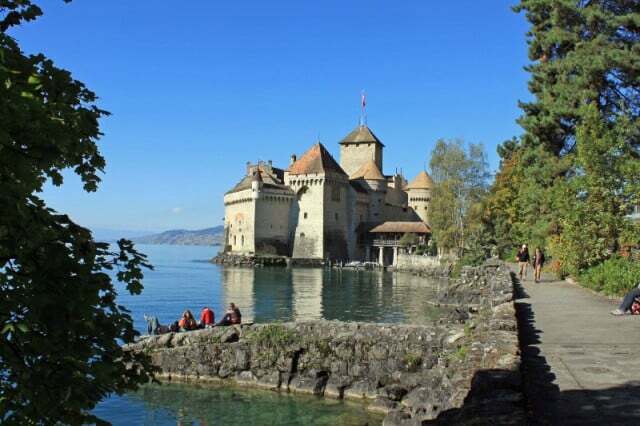 Transportation to Chillon Castle is very easy with great road, railway and boat links to other parts of the Lac Léman region and the rest of Switzerland. Visiting Chateau de Chillon is easy too as the castle is open year round. The fortress is a great day-trip destination from Geneva, Lausanne, and ski resorts in the French and Swiss Alps. It is also a fine rainy weather option and fun to visit in any weather. Castle tickets are available online. Buy Château de Chillon Castle Tickets Online.